To add insult to… insult, the forum thread on this specific comic makes it quite clear that people who know nothing of Summer Glau, Firefly, Serenity, or Terminator: The Sarah Connor Chronicles are unworthy readers to this comic series. It’s at times like these that I really feel like an outside observer to geek culture. Or, at least, to the Anglo-American part of geek culture. It’s not a bad feeling, actually. It makes me smile. Smugly. I choose to laugh at pretension, arrogance, pedantry. Those occasions are also stimulating my thoughts about phenomena relevant to ethnographic disciplines, especially folkloristics and the study of verbal art. One approach to cultural identity is as a group of people’s set of common reference points from core texts (in the broadest sense of “text”). There’s a special kind of bond linking people who know the same song, who have read the same book, who have watched the same cartoons during childhood… A “reference,” in this case, is rather specifically a shared item, an element of shared experience. A community of experience is built through these references. Sometimes, these references cross seemingly obvious boundaries of cultural identity, but there’s a type of clustering effect with bundles of references bringing people closer together. For English-speakers in the United States, these reference bundles may seem much more common than they really are, given the spread of many of these references. For minority populations (including French-speaking North Americans and perhaps even English-speaking Canadians), the reference bundles are more easily perceived as “culture-specific.” My guess is that every Québécois of my generation is “painfully” aware of the fact that Passe-Partout can only serve as a cultural reference for a relatively small group of people and that, within that group, it serves as a distinctive reference. The fact that the scope of distinction is so small for a children television show which was seen by millions makes it easy for us to think about cultural specificity. Not that I’m saying mass media are a cause of (or a condition for) a sense of cultural specificity. I’m a holist, not a determinist. I just wish to think about what part mass media play in identity negotiation. Minority groups may use “mainstream references” to claim a broader cultural identity and, in so doing, demonstrate a certain level of cultural awareness. Which leads me to go from the semi-academic to the ultra-personal. The reason I tend to react to pretension, arrogance, and pedantry (even by smiling) is linked to my own “third culture” status as well as to my Québécois upbringing. Even though I try to react differently, I tend to perceive comments about lack of “pop culture” knowledge as exclusionary. In fact, I have the same perception with academic culture. Even though I have uttered the same string of words in the past, I often react strongly to the “You haven’t read that?” and “You don’t know this band?” exclamations. When I say these words, I’m typically expressing genuine surprise. When some other people say these words, I often perceive a type of, well, misdirected condescension. So I choose to smile smugly because I find outsmugging smugness is an effective strategy. Admittedly annoying to those thus piqued, but effective nonetheless. Now, I’m not saying people who throw these remarks out are “bad people” or that they’re doing anything outside the bounds of normal social life. Notice that my use of “pretension, arrogance, and pedantry” is not meant as an insult. These are common attitudes with many people. While these may be annoying attitudes, I’m really not judging anyone for displaying them. But I do claim a right to be at least amused by such attitudes. I guess I’m just ranting. More precisely: I guess I’m just in a ranting mood. In my case, this might be a Good Thing™. This entry was posted on Saturday, April 5th, 2008 at 14:29	and tagged with community of experience, core texts, cynicism, enculturation, Firefly, groupthink, knee-jerk reactions, language diversity, mass media, pop culture, rituals, Serenity, shared experience, télévision, xkcd and posted in Academia, arrogance, audience, cultural awareness, cultural capital, cultural diversity, cultural identity, culture, diversity, Ethnography, folkloristics, Francophones, geek culture, glocal, hegemony, intellectuals, personal, personal life, Places, popular culture, ramblings, rants, relativism, social networks, sociocentrism, U.S. exceptionalism, U.S. media. You can follow any responses to this entry through the RSS 2.0 feed. @Kikelet Nah, not really. 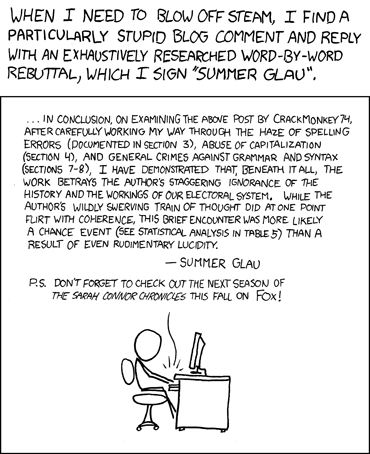 It’s not the same kind of rant as the xkcd one. And it’s really not directed at any specific individual. It’s just something about being a Québécois living (on- and offline) in U.S.-focused cultural contexts.